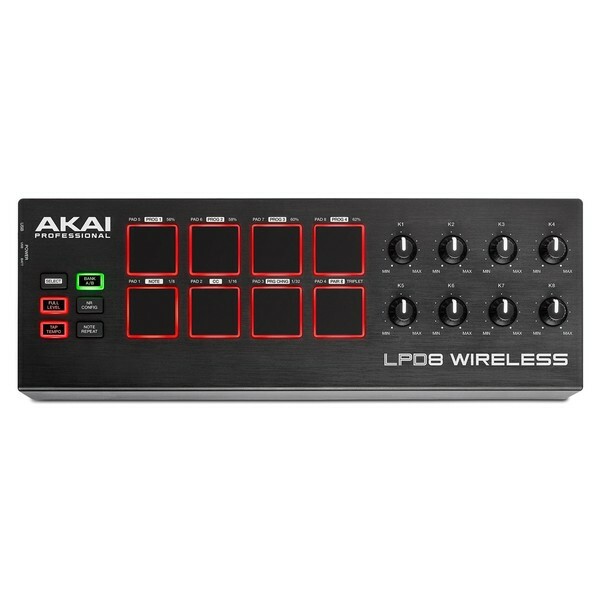 The Akai LPD8 Wireless MIDI Controller is a compact, Bluetooth enabled drum pad controller featuring 8 backlit MPC-style pads and 8 encoders. The Akai LPD8 is ideal for the digital musician on the move, allowing you to setup and perform wherever you go. The eight ultra-sensitive pads are ideal for finger-drumming as well as trigger one-shots, loops, bass lines and more. The Akai LPD8 is wireless thanks to its built-in Bluetooth connectivity, freeing you from the restriction of wires. It also features controls for switching between banks, Tap Tempo, Note Repeat and more. 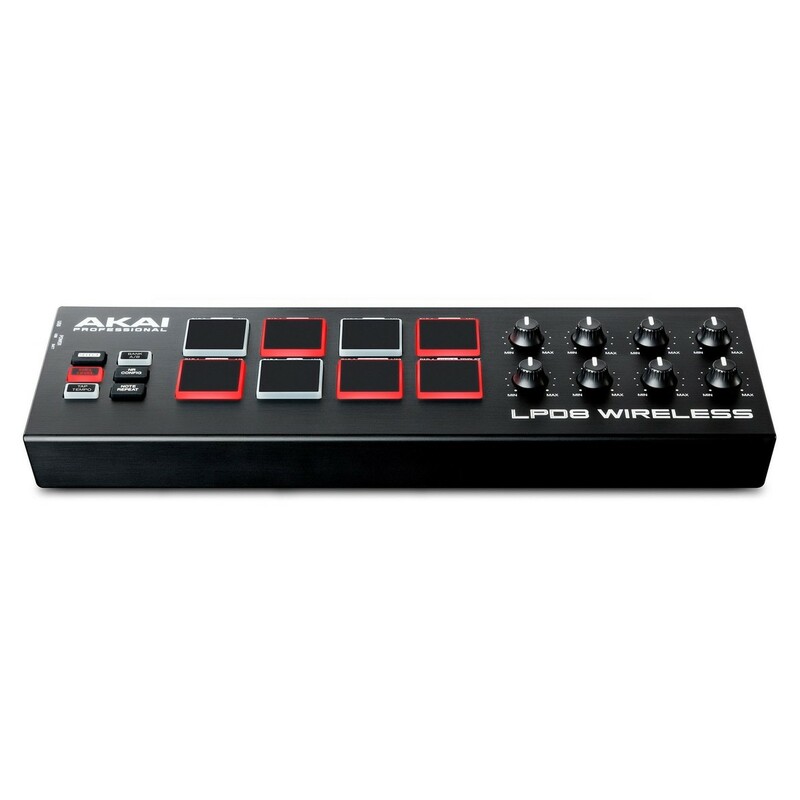 Additionally, the Akai LPD8 can be powered via USB or three AA batteries for added convenience. The eight backlit MPC-style pads are perfect for finger-drumming as well as triggering one-shots, loops, samples and more. The pads are velocity-sensitive delivering a natural and articulate sound, ideal for live performances and musical compositions. 8 encoder Q-link style controls allowing you to add and control effects on the fly, perfect for triggering and controlling automation. A whole host of other controls are also included such as Full-Level, customisable Note-Repeat and Tap Tempo functions. These versatile controls allow you to add flair and dynamics to your performance, giving you ultimate control over your sound. As well as featuring a multitude of versatile functions, the Akai LPD8 also features customisable controls for enhanced configurations. The 4 onboard programmable memory banks allow instant recall of your own personal controller configurations, as well as being able to manage pad assignment, CC numbers, program change numbers and more. You can also store and manage all your programs using the LPD8 wireless editor software, allowing you to adapt to any situation. 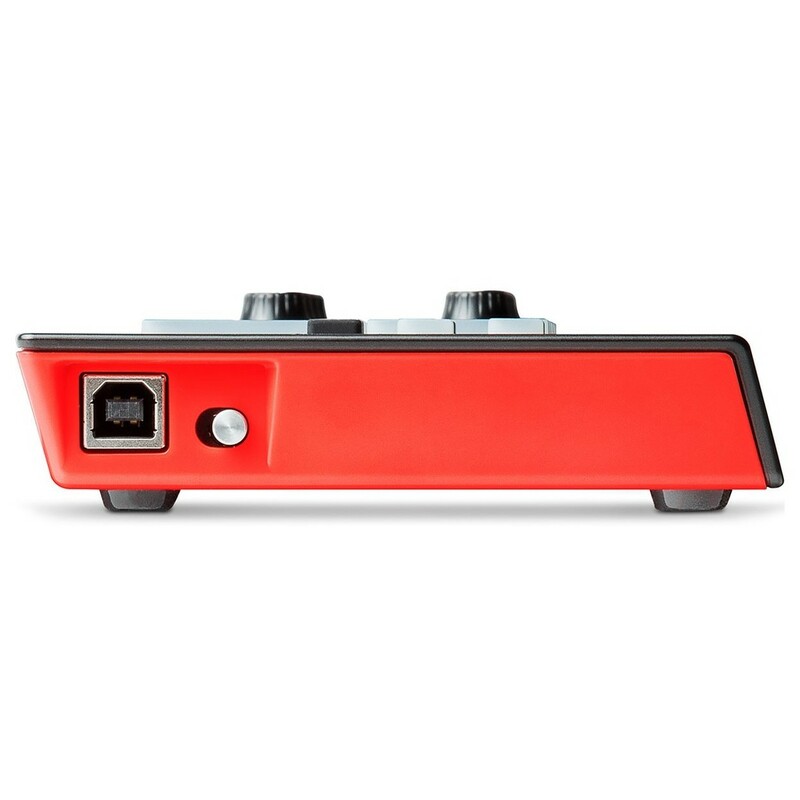 The Akai LPD8 is ultra-compact in size, allowing you to take the unit anywhere you go. 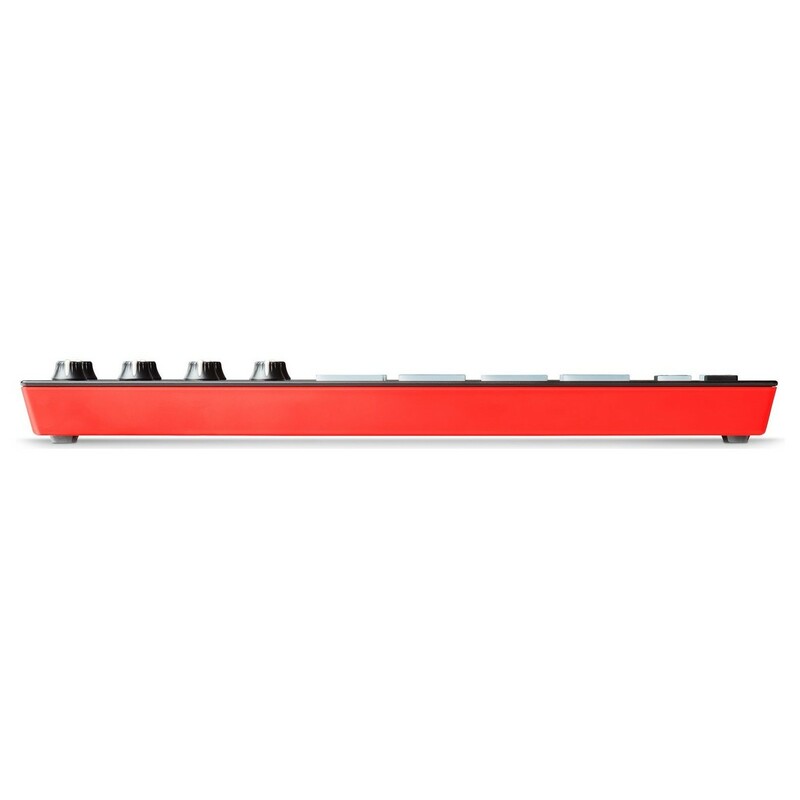 The highly portable design makes the LPD8 the ideal choice for the digital musician on the move, allowing you to create music as well as collaborate with others wherever you go. Its wireless Bluetooth connectivity frees you from the restraints of cables, allowing you to get setup and started within minutes. Setup is easier than ever thank to its class compliant design, offering effortless integration without the need for installing drivers. The unit itself can be powered either by USB cable or with 3 AA batteries (not included) for optimal portability.